The QSR industry is the perfect place for digital signage. Digital Menu Boards combine beautiful design with functionality, purposed to showcase pricing and promotions, products and services, all within a branded easy to use platform allowing for easy updates to keep content fresh and relevant on a daily basis. The benefits of digital menu boards span from easy customer upselling to seamless item rotations. 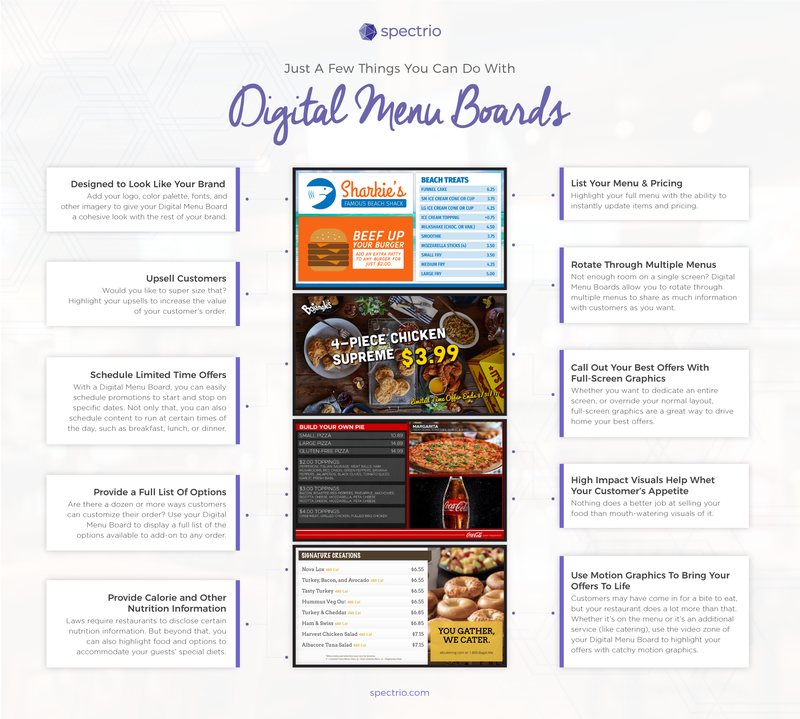 This infographic, created specifically for the QSR space, lists the many benefits of using digital menu boards in your restaurant. Learn how digital signage promotes your brand, lists menus and pricing, and provides easily interchangeable specials. Click on the image below to share or enlarge. Copyright © 2019 Spectrio - All Rights Reserved.